I see you. Yes, you, the one hiding in the bathroom with her head in her hands. I know you just endured 40 minutes in mama hell as your little one had (yet another) homework meltdown. I heard her screaming and crying and saw her face turn tomato red as she released her frustration with clenched fists and kicking feet. I felt your frustration as you tried to explain the assignment to her (in between her gulps for air) and give examples of how to answer the questions. I sensed the effort you made to stay calm—count to 10, take deep breaths, and pray—and be sympathetic because you remembered losing your patience last time and how much you regretted it. I know how with each passing minute, your ears began hurting and you just wanted to run away and hide because the situation seemed hopeless. You felt hopeless. Beaten up. Exhausted. Just. Plain. Defeated. No one ever told you it’d be this hard. How there would be moments, days even, when you didn’t like being a mama. Days when you couldn’t see past the endless crying, the long nights, the sore arms and back from the non-stop carrying, the power struggles with someone half your size, the feeling of having lost yourself. Days when you couldn’t see past your own tears. I get why your kids say you go to the bathroom a lot ’cause that’s one of the few places you can hide. Even for just a minute to sob and breathe and splash cool water on your red-rimmed eyes. To let yourself fall apart before you need to pull yourself together again. To remove yourself from the situation because it is just that—a situation. An experience to struggle through and to learn from. Because this mamahood journey has a lot of ! @#$% hard situations, and there’s still so much to learn about being a good parent. You didn’t think it’d be so hard to love your kids. But it is. Not because they aren’t lovable (they are so lovable when they’re sleeping! ), but because you’re human. You only have so much energy, attention, and patience to give. That’s why you struggle. But remember this: your child is struggling, too. She is struggling to grow into her own skin. He is struggling to manage his emotions, his fears and frustrations at feeling helpless in this great big world. They are struggling to learn words, facts, and theories. They are struggling to feel accepted, valued, and loved—especially when they are not acting lovable. And they are looking to you to help them. Okay, so that’s not what you wanted to hear. But it’s the truth. You play one of the most important roles in your kid’s life. You’re their mama. The one who gets to witness their tantrums and meltdowns. The one who has more gray hair and wrinkles (and a secret stash of chocolate) than the other parent in the house. You are the one whom they trust enough to bare the darkest, scariest and craziest parts of themselves to. You’re also the one who got a letter slipped through the crack of the bathroom door the day of the 40 minute meltdown. 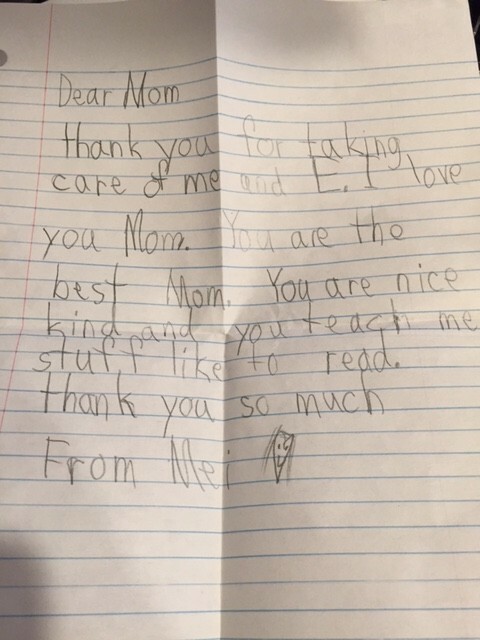 A letter written from the heart of your little one that made you cry and almost made the craziness you endured worth it. There are not enough words to describe how hard parenting is. But there are also not enough words to express how humbling, amazing, and fulfilling it is, too. Who do you trust to bare the darkest, scariest, and craziest parts of yourself to? 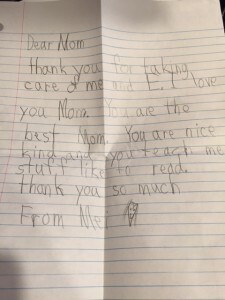 This entry was posted in Mamahood and tagged Adele, parenting, Sara Marathas, struggling mama.